The Nissan Motor Corporation has had a long history of success, and has a proven track record when it comes to both its Nissan and Infiniti lines. The company had small beginnings as a simple parts division of a larger company called Tobata Casting. However, in 1934 Nissan Motor Co. was officially named, and in 1935 the firm's first vehicle was produced through a system called integrated assembly. Since that time Nissan has expanded into the American market, and as of 2011, has become the sixth largest automobile manufacturer in the world. In 1989 Nissan made a move into the luxury car market segment. This was around the same time that Lexus and Acura were being launched, and the market proved to be stiff with competition. The Infiniti line may have had a rough start, but today it is one of the premium vehicles on the market. Since its inception, Infiniti has developed into a quality brand, and is a great alternative to the Nissan. However, these different product lines cater to different needs. As a result, you should determine what is best for you before making a decision either way. What is it that you value most? This is the question you need to ask yourself when comparing these two products. Do you prefer to go the economic route of finding a functional car that will last and won't hurt your bank account? Or is price a nonfactor? The Nissan line provides drivers with everything that they need to be comfortable, while still getting exceptional performance from their vehicle. A very popular model, the Nissan Maxima, comes standard with a 3.5-liter V6 engine that puts out 290 hp. It also includes a Bluetooth phone system, power seats and windows, and the Nissan intelligent key system all for around $31,000. An upgrade to the premium package will land you a dual panel moon roof, a rear window sunshade, and Cherry wood trim. Although the Maxima is intended for the general consumer it still features luxury items. Compare this to the very popular Infiniti G37 sedan. This vehicle comes standard with a 3.7-liter V6 engine that puts out 328 hp. This is a significant increase that should be noted. The base model G37 starts at a competitive $32,850, and includes all the items that are expected of a standard car. However, the "luxury" aspect of the Infiniti is lacking in this base model. Jump to the premium package and you will access features such as a sliding glass moon roof, a 10 speaker Bose stereo, a rear sonar detection system, and a telescopic steering wheel. This is the package that differentiates this product line from its humble Nissan counterpart. The addition of this package will bump your total price up by $2,500. When it comes down to it the Nissan is a solid car that delivers reliable performance, but the Infiniti delivers a driving experience. Do the extra bells and whistles warrant the increased price? The answer to this question is dependent upon the driver. However, lets look at the facts. 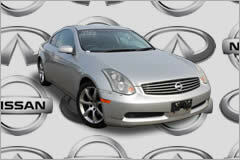 The Nissan line is priced at an affordable amount, and has a decent resale value. The features that you will get for the amount you pay will leave you satisfied, and the vehicles power is acceptable, but will leave something to be desired for those that love performance. The Infiniti is very competitively priced with a great resale value. However, if you are considering the base model you may want to take another look at an upgraded Nissan. Otherwise, the performance that this car delivers will leave a smile on your face as you cruise down the highway. Ultimately it comes down to functionality, performance, and comfort. Is the additional horsepower and extra comforts a selling point? That's for you to determine.